I have recently received a couple of inquiries as to the progress on the P-40F/L Conversion. Well, I just received a bit of an update with pictures from Derek Bradshaw who is preparing the masters. I don't have clearance to post the pictures and the details, but I will say this-- the conversion is coming along splendidly. I am continually impressed by the level of work and detail going into this conversion. Derek is a true master! I was particularly impressed by the level of interior detail going into this conversion. I still say that this will be, without a doubt, the best Merlin-powered Warhawk in any scale, whether kit or conversion. Believe me when I say you will not be disappointed in this conversion. When will it hit the market?-- I would estimate it will be available in the next couple of months. That being said, please remember that Derek is working on it when time allows, and it could be delayed. I believe it will be marketed by Grey Matter Figures in the UK. I don't know whether they will have an outlet or distributor in the US. If not, you should be able to order it directly from Grey Matter. And if you want to get an early start on your P-40F/L project, don't forget that Eli Raphael of Zotz Decals has the 1/32 scale MTO P-40F/L decals already available which were designed for this conversion. They are superb as well. You can see Mark Joyce's review of these decals below. Now, you ask-- why am I pitching this? No, I have no financial stake at all in this. I did assist both Eli and Derek in getting this project underway, and I simply would like to see a good Merlin-powered Warhawk in 1/32 scale... and it looks like that is going to happen! 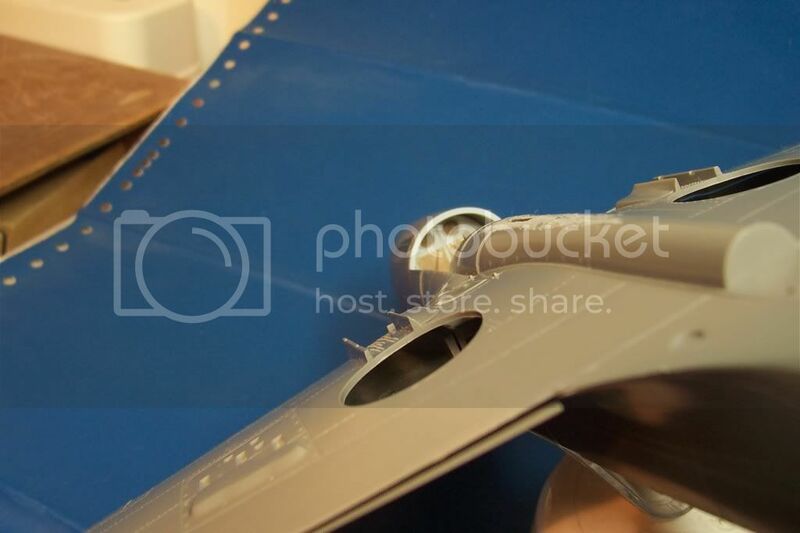 The P-40F/L decals for this conversion are already available from Zotz decals. They are as nice as the conversion will be. Again, I have no financial interest in these items, except I did help provide info to Derek and Eli of Zotz Decals-- all in an effort to make available an excellent 1/32 Merlin-powered Warhawk. p.s. Did he have to reposition the exhaust openings? I am not sure that he had to reposition the exhaust openings. 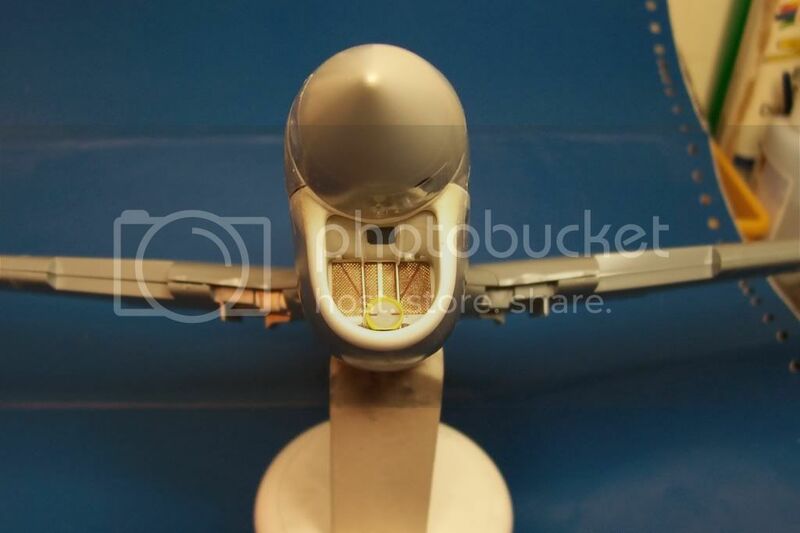 As I understand, the master for the upper and lower nose sections were not made from the Hasegawa nose parts. To get the correct shape, I believe Derek used some parts from other kits and then heavily laminated plastic, which was then shaped to the desired correct shape. 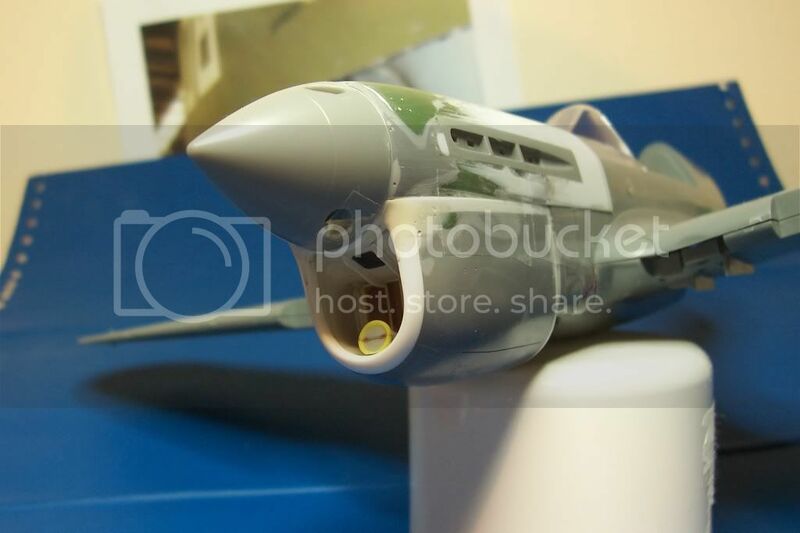 However, the exhaust openings were taken off the Hasegawa kit and put on the new nose so the modeler could use the Hasegawa exhausts with the conversion-- at least that is my understanding of what is going on. Thanks for the information and link, Bill. The conversion looks outstanding so far! I did have to reposition them (they are not parallel either - they are slightly inclined!). Bill is correct. 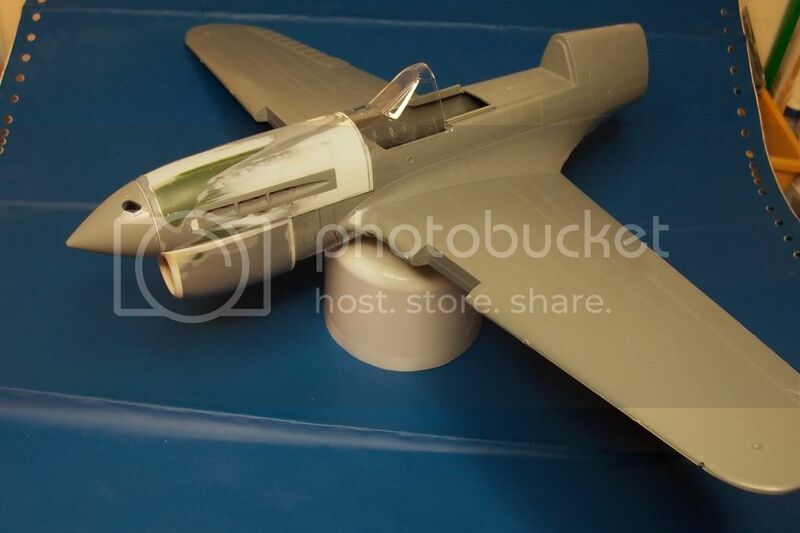 The background to this particular nose conversion is that Vasko Barbic (Warbird productions) had originally created the single piece P-40F/L nose (many years ago) by heavily converting the Revell P-40E item. This was intended to be a 'one-off' conversion for personal use, and was not originally intended for general production. However, Vasko decided that he wanted to make it into a production item, and asked me to complete it and adapt/modify it to fit the newer Hasegawa P-40 kits. This is what I am doing. Unfortunately, I had ecountered problems in preparing his original nose for production during the modification process, which has forced me to almost completely rebuild the nose - which is where I am at present. Hope that clarifies things a little. That explains a lot. I was completely confused why you wouldn't have used the Hasegawa top engine panels. Don't forget to fill the "scallop" at the aft end of the exhaust openings. This was only on the P-40E. No problems Vince. I am working from a Revell orignated pattern, which was made for the Revell P-40E kit - It is too narrow where it meets the cockpit, so I had to widen it and modify it to match the Hasegawa kit (I have may more pictures, but I have not posted them, which is why you will have visulise how the nose looked before I chopped it into pieces). I could have utilised the Hasegawa cowl top, but it would have been like piecing a jigsaw together - then I would still have to remove the intake scoop and extend it in length! Actually, the short-tail F had the scallops, as well as the round/tubular exhausts, like the D/E models. Since one of the markings on Eli's sheet is a short-tail ("Miss Fury"), to do it accurately the scallops would have to remain. I believe Hasegawa includes parts to fill in this area for the later P-40 marks; at least Hasegawa does for the 48th scale kits. 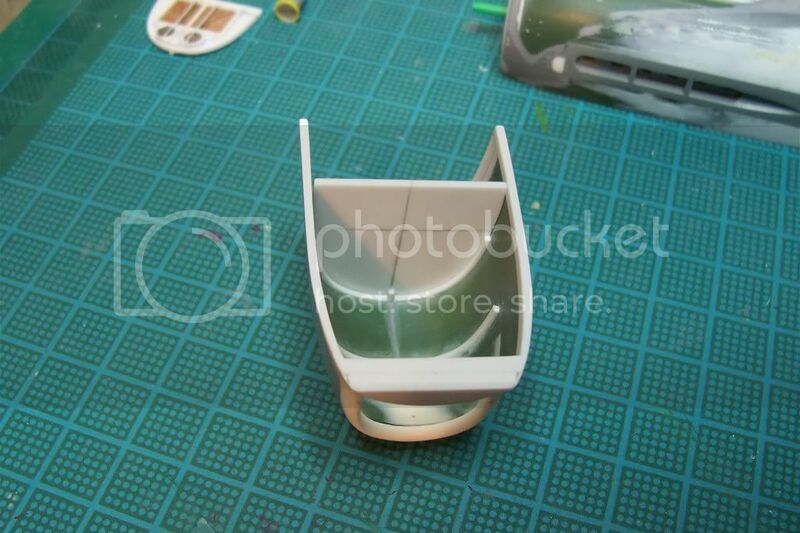 Perhaps these same parts could be used for the resin nose? Derek, thanks for posting the photos. Keep up the good work! Thanks for the comments. I intend tomake seperate scallops, but if Hasegawa do actually provide these as seperate items, I would very much welcome a couple! (maybe someone can confirm this? - Looking at the kit breakdown for these parts, they would maybe, or should be, supplied as completely alternative items to my mind?). My mistake about the scallops. Yes, indeed, the early "F" model had them. Derek, was the Merlin nose longer that the Allison nose on the real aircraft? I just looked at my Hasegawa P-40N kit and I noticed that they include a separate exhaust panel without the "scallop". It is on parts tree "E". In fact, it is the only item on parts tree "E". I assume that the P-40E kit has the scallop in its exhaust panel, but I don't have an example of the P-40E kit in front of me to confirm this. I am assuming that Derek is working from a P-40E kit. Regardless, it does not look like there are separate scallop inserts. That's looking really great Derek! A good number of years ago I tried converting the Revell to a L which didn't go all that good, there really is a tremendous amount of work involved in this and finding accurate drawings isn't all that easy either. I have some factory drawings of the nose as well if they would ever help.